The aim of the present study was to describe the development of strategies to prevent and rehabilitate musculoskeletal pain among surgeons. Musculoskeletal pain affects surgeons’ life, and evidence on interventions for effective prevention and rehabilitation is lacking for this occupational group. An Intervention Mapping approach was used to develop intervention strategies specifically tailored to surgeons. This approach entailed conducting a systematic scoping literature search and semi-structured interviews with six surgeons. The first step was to develop a logic model of the problem of musculoskeletal pain among surgeons. Step two was to formulate health-enhancing outcomes and performance objectives for the intervention, while in step three theory-based methods and practical strategies for the intervention were identified. The present Intervention Mapping study demonstrated that musculoskeletal pain among surgeons is a complex area that needs attention. Our findings highlight a need for individual behavioural changes as well as organisational, attitudinal, and management changes. A substantial amount of literature emphasises that surgeons are at high risk of developing work-related musculoskeletal pain [1–6]. Work-related musculoskeletal pain is a growing problem and accounts for approx. 40% of all occupational diseases in Europe . The presence of musculoskeletal pain has been associated with reduced quality of life for the individual, reduced productivity and increased sickness absence at the workplace [7, 8]. The annual cost worldwide attributable to occupational pain has been estimated to be $560 to $635 billions , and in Europe it constitutes around 1.5 to 3% of the European gross domestic product . Work-related musculoskeletal pain has, therefore, a significant health and socio-economic impact. The operation theatre is a complex environment, and technological developments have been evaluated primarily from a patient perspective with little or no consideration of the impact on the surgeon’s working conditions [11, 12]. Repetitive motions and cumulative awkward postures are an everyday occurrence for surgeons. Studies report that surgeons lack the knowledge on how to adapt to less physically demanding work postures and often disregard their own comfort [13–17]. Until now, reducing surgeons’ pain has been attempted by focusing on reducing the physical workload by implementing new ergonomic equipment in the operating theatre, changing work posture, decreasing overall caseload, or implementing micro-breaks during surgery [18–20]. Only the latter has resulted in lower pain scores . To our knowledge, no randomised controlled trials have evaluated interventions regarding preventive or rehabilitating strategies of musculoskeletal pain in surgeons. This is pertinent for this highly specialised group, who perform a variety of tasks and who often work in long shifts. To meet the specific needs in this group of workers and obtain good compliance, an intervention must be designed based on a participatory approach . Involvement of the surgeons in the process is essential because it ensures relevance and ownership of risk identification, solution development, and implementation of change. To structure this process and ensure the development and implementation of a feasible and effective intervention, the concept of Intervention Mapping can be useful. Intervention Mapping is a problem-driven and a theory-driven protocol, that includes knowledge obtained from the literature and involvement of key stakeholders . It encompasses six key steps: 1) a needs assessment to identify the problem, 2) the identification of outcomes and change objectives, 3) the selection of theory-based methods and practical strategies, 4) the development of an intervention plan, 5) generation of adoption and implementation plan, and 6) the generation of an evaluation plan. Intervention Mapping is well expounded in the health promotion literature and has proven useful in other occupational settings for different outcomes [24–27]. The present study focusses on the first three steps in the overall framework of Intervention Mapping. The aim was to develop feasible strategies that may potentially prevent and rehabilitate musculoskeletal pain among surgeons by using Intervention Mapping. An Intervention Mapping protocol was used to ensure the intervention that was developed was grounded in theory. The utility of basing interventions upon sound theoretical frameworks is that theory can help to identify effective methods for behavioural change, as well as explain and predict the process of change . This study applied the first three steps in Intervention Mapping. Overall, step one was to define the problem, step two was to specify intervention outcomes and expected changes, and step three was to design a feasible and effective intervention with strategies that can alleviate problems that were identified in step one. The three different steps encompassed additionally specific tasks before moving to the next step [28, 29]. Figure 1 details the specific tasks in each step. A systematic literature search with a scoping approach was performed as part of the Intervention Mapping methodology . In accordance with the scoping approach the systematic literature search was conducted in order to obtain in depth knowledge of any potential problems and challenges surgeons may present with. The knowledge was used to compose the semi-structured interview guide. The databases PubMed, Embase and CINAHL were searched until 17 April 2017 using the following search strategy adjusted to fit each database criteria: (surgeon*) AND (occupational exposure OR work-related exposure OR job-exposure OR job demands OR workload OR work-related) AND (musculoskeletal disorders OR musculoskeletal diseases OR musculoskeletal pain OR occupational diseases OR work-related diseases). Articles were selected based on 1) title, 2) abstract, and 3) full text. The systematic literature search was conducted by author AH and continuously discussed with author LNA and author TD. Semi-structured interviews were conducted face-to-face with surgeons to understand the surgeon’s type of job, its influence on health, and their experiences with health initiatives. Based on the literature search, a semi-structured interview guide was designed. It evaluated the issues of the surgeons’ workplace, their experiences with pain, approach to their health, and their experiences with health initiatives as well as their experiences of challenges concerning such health initiatives. Interview questions were formulated in everyday language and were preceded by descriptive questions to enhance confidence and familiarity between the interviewed surgeon and the interviewer. The semi-structured interview guide was discussed between co-authors before conducting the interviews. Only the interviewer (author AH) and the participant were present during the interview. Interviews were conducted in Danish, audio-recorded and transcribed verbatim by author AH. Participants were subsequently asked to confirm the accuracy of the content. The quotations used in the present paper were translated from Danish to English by a professional translator. The analyses were based on systematic text condensation, which is a descriptive and explorative method used for thematic cross-case analysis . It is a four-step process derived from theories of phenomenology and supports the surgeons’ experiences being expressed in their own words. Recruitment for the interview was done by author TD and an established contact person at two medical wards (Gastrointestinal and Gynaecology and Obstetrics) at two distinct hospitals. Recruitment was based on earlier contact and therefore convenience sampling was used. Surgeons interested in participation were sent written information and ensured complete anonymity. All interested surgeons agreed to participate. Results from the literature search and semi-structured interviews will be presented to enable a detailed description of determinants that influence musculoskeletal pain among surgeons. It was on the basis of these results that the logic model of the problem was developed, and the overall goal was formulated. The systematic literature search initially identified 179 articles (Pubmed: 71, Embase: 95, CINAHL: 13). Based on the review procedure 14 articles were considered relevant. Among the relevant articles was one systematic review  including 35 studies about the prevalence of musculoskeletal pain among surgeons performing minimally invasive surgery. All types of study design were searched. Except for the systematic review only studies with quantitative methodology were identified. The literature search supported that work-related musculoskeletal pain is a common and documented problem among surgeons [5, 33, 34]. Surgeons have long workdays and a physically demanding job. They are exposed to cumulative awkward postures, repetitive movement, and strenuous exertion during the performance of surgery, which may lead to muscular strain and ultimately the development of musculoskeletal pain [6, 18]. A systematic literature review from 2017 included 35 studies and found a prevalence of musculoskeletal pain among surgeons varying between 73 to 88% . A prevalence well above that in the general working population . The most prevalent painful body regions were the neck and the lower back [14, 18, 20, 34]. Studies report that surgeons believe their surgical performance is affected by pain [5, 20], and that surgeons do not pay attention to their own health during surgery [12, 13]. In a study by Park et al., 40% of the surgeons reported to disregard their physical complaints . Another study showed that 36% of the surgeons reported to work in spite of pain, as they considered pain to be part of the job . In addition, many surgeons reported to be unaware of physical ergonomic guidelines relevant to the operating theatre [16, 17]. Six surgeons from two Danish hospitals volunteered to participate in the present study. They were interviewed at their workplace in an undisturbed setting and with a duration of 52–78 min. All the surgeons were experienced and had worked as surgeons for six to 20 years. Weekly working hours were reported to be between 45 and 60 h. Musculoskeletal pain was present for four out of six surgeons. Characteristics for the six surgeons are shown in Table 1 (study participants’ names are pseudonyms). We applied systematic text condensation to identify themes in the interviews . The analysis identified four main themes derived from the data: (1) Experienced challenges; (2) Surgeons do not complain; (3) Taking responsibility; (4) How to handle it. Additionally, three subthemes were identified under the fourth theme: (a) work-related focus on physical ergonomics, (b) Micro-breaks and physical activity and (c) Experiences with health promotion initiatives. In the following, the results from the interviews are presented. The surgeons did not share concerns with colleagues about their work-related musculoskeletal pain. It is as if there is a mutual acceptance about musculoskeletal pain being a natural consequence of their work. From a long-term perspective, the surgeons are conscious of the fact that musculoskeletal pain may challenge their chance of maintaining their job. Painkillers are used as a quick short-term solution, providing the surgeons with the ability to do their job and take responsibility for the patients. The surgeons have tried a range of methods to manage their musculoskeletal pain. Initiatives initiated by the management e.g. supervision with a person from the occupational clinic, as well as individual strategies e.g. consulting a physiotherapist. What is common is that the surgeons also describe why it has not been successful. Some of the surgeons explained that they felt uncertain because they lacked the knowledge on how to adjust the available equipment and their workplace layout as well as other potentially beneficial initiatives. The surgeons demonstrated some knowledge of possible solutions. One solution, for example, was to break up their work-load. However, the surgeons did not make use of this opportunity during their work day, and nor did they indicate any collective understanding or regulations for breaks. The lack of motivation for activities with resistance bands expressed by this surgeon may be explained by the fact that he had not experienced musculoskeletal pain related to his work. When asked, he reflected that he might be more motivated to take up this kind of preventive initiative if he had musculoskeletal problems. Even though surgeons may be negative about doing physical exercise training during working hours, it is crucial that the management genuinely support and prioritise surgeons’ health. Providing the time for surgeons to carry out health promotion initiatives as part of maintaining their work ability is essential for success. Based on the existing literature and the semi-structured interviews, a needs assessment was conducted to create a logic model of the problem as summarised in Fig. 2. Task 1 identified how musculoskeletal pain will affect the surgeons’ quality of life; for example, if the surgeon was forced to stop his/her surgical career. Task 2 identified the problem and the physical consequences that musculoskeletal pain has for the surgeons, such as bodily stiffness, muscular fatigue and mental exhaustion. Task 3 identified the behavioural and environmental factors that are believed to cause the surgeons’ musculoskeletal pain. The behavioural factors identified were for example accepting pain as a working condition, not using ergonomic equipment, or not engaging in physical exercise training. Environmental factors that may contribute to surgeons’ musculoskeletal pain were the awkward and static work posture, high physical demands, and social norms at the workplace. Finally, in task 4, the personal determinants were identified and separated, based on which factors affected the surgeons’ behaviour or environment. Personal determinants affecting surgeons’ behaviour included lack of knowledge of how to apply the physical ergonomic guidance, lack of skills to cope with musculoskeletal pain, and low motivation towards health enhancing initiatives at the workplace. Personal determinants affecting surgeons’ environment included personal norms adopted from the social environment, lack of resources (time and money), demands regarding efficiency improvement, and lack of political awareness. The overall goal was based on the high prevalence of musculoskeletal pain identified in the literature search and confirmed in the semi-structured interviews. Thus, the overall goal for the intervention was to identify ways to prevent and rehabilitate musculoskeletal pain among surgeons. This overall goal was subdivided into three categories. Primary prevention, with the aim of avoiding the development of musculoskeletal pain in all surgeons. Secondary prevention, with the aim of tracing and preventing the development of musculoskeletal pain among those surgeons who are in a high-risk group. Tertiary prevention, with the aim of rehabilitating musculoskeletal pain, preventing the recurrence or consequences of having chronic pain. The logic model of the problem formed the offset for the first task in step two, namely, to formulate health enhancing outcomes for the intervention and to further divide this into a behavioural outcome and an environmental outcome. The behavioural outcome was determined as: Surgeons should be able to prevent and rehabilitate their musculoskeletal pain. The environmental outcome was determined as: The hospital and the management should prioritise surgeons’ work-related musculoskeletal pain and be an active partner in the prevention and rehabilitation process. From the two listed outcomes, performance objectives were formulated. The performance objectives describe the actions needed to be achieved by the two defined outcomes. Surgeons gain knowledge of how their work and awkward and static work postures affect their health. To achieve the above performance objectives, we identified six theoretical determinants that were deemed useful in achieving each performance objective and thereby changing the desired outcomes. The six theoretical determinants comprise knowledge, skills, attitude, social influence, self-efficacy, and expected outcomes (Table 2) and originate from Theory of Planned Behavior  and Social Cognitive Theory . These two theories both contribute with determinants within behaviour and the surrounding environment’s impact in relation to behavioural change . Management and surgeons support colleagues’ use of micro-breaks. Expectation that if the management actively prioritises prevention of musculoskeletal pain among surgeons, the surgeons will also prioritise the issue themselves. Knowledge is often considered as a precondition for other determinants. In Theory of Planned Behavior and Social Cognitive Theory, knowledge per se does not create a change but is essential for the other determinants to create a behavioural change. From the literature search and the semi-structured interviews, it was evident that surgeons lack knowledge about physical ergonomics in the operation theatre and that the incorporation of micro-breaks may relieve their pain. In addition, enhancing surgeons’ knowledge regarding the benefits of physical exercise training, may facilitate a change or influence the other determinants. In relation to achieving a higher level of knowledge, the development of new skills or competences is crucial to facilitate the desired change. Many of the surgeons claimed that they had not received any specific training on proper work postures to lower the physical demands or how to use ergonomic equipment in the operation theatre. Likewise, they indicated that the management did not support the surgeons with education, knowledge-sharing or was an active participant in this process. Attitude from Theory of Planned Behavior is very important, as our attitude towards change is pivotal for them to happen. Several of the surgeons demonstrated a negative attitude towards engaging in physical exercise training during work hours. Work hours should not be used to ensure surgeons’ own health since patients’ health takes priority. However, surgeons highlighted the importance of being physically active, and many of the surgeons engaged in physical endurance exercise training during leisure time. Social influence deals with the surroundings and refers to the environmental influence on the outcome. During the interviews, several of the surgeons mentioned previous health promotion initiatives at the workplace, but also indicated that management did not seem to appreciate them taking part. They were told to do it when they felt they had the time. This lack of support may hinder potential change. Self-efficacy from Social Cognitive Theory is equivalent to behavioural control from Theory of Planned Behavior and deals with an individual’s believe in their own competence to change. The likelihood for a given change to happen is greater if the individual believes they are capable of changing their behaviour. From the interviews it was evident that several of the surgeons had taken steps to reduce their pain. They had turned to advice from physiotherapists, for example with regard to work posture or exercises to relieve pain. Likewise, a study demonstrated that 85% of the surgeons had received treatment for their work-related pain . Thus, several of the surgeons demonstrated a high degree of behavioural control. Expected outcomes relate to the individual’s positive or negative views of the potential consequences of a given change . Some surgeons indicated that they were not motivated to participate in resistance band strength training exercises at the workplace. Such scepticism may seem obstructive during an attempt to implement health promoting actions; e.g. physical exercise training for the surgeons. However, you may be able to facilitate participation, if you manage to convince the surgeons that preventive physical exercise training or micro-breaks would be beneficial for their work-related musculoskeletal pain, for their future as surgeons, and, above all, for the health of patients. The last task in step two was to set up the logic model of change. This model contains knowledge from the preceding steps and illustrates the pathways of an effective intervention (Fig. 3). To identify practical strategies for the interventions, the six theoretical determinants and change objectives were matched with theoretical methods and strategies in a matrix (Table 3). Surgeons and management prioritise and enforce the importance of health promotion initiatives. Ward management initiates upstart meetings with newly appointed surgeons to promote health initiatives. Appointed health ambassadors initiate and maintain health promotion initiatives on local surgical wards. Ward management establish the structures that make it possible for surgeons to perform health promotion activities at work. At workshops surgeons get detailed knowledge about benefits from health promotion activities. Health ambassadors support surgeons’ health and initiatives for maintaining good work ability for surgeons. From the Social Cognitive Theory, the theoretical methods of modelling and verbal persuasion were applied to change the determinants attitude, social influence, self-efficacy and expected outcomes . Similarly, active learning and guidance from Social Cognitive Theory were applied to affect the determinants’ skills and self-efficacy. In addition, the method “Personal risk” from the Precaution – Adoption Process Model was applied to change the determinants’ knowledge and expected outcomes . Using “Personal risk” as a method may provide motivation and give the surgeons knowledge about the personal consequences that are associated with their current behaviour. It may promote them to act because of the new knowledge and a positive mind-set towards expected outcomes. Modelling and verbal convincing were applied for the surgeons to see that others have succeeded with the same behaviour. Appointing role models or health ambassadors that facilitate the intervention and success with it may prompt the rest of the group to follow, because it enhances their self-efficacy towards the new behaviour. It is important to involve the management at this stage, as an active and visible management may promote the surgeons to take part and thereby facilitate new social influence. Active learning and guidance were applied to give the surgeons the competences and skills to accomplish the intervention, for example, by demonstrating physical ergonomic adjustments in the operation theatre or how to perform physical exercises to relieve pain. It is important that the surgeons become familiar with the new strategies and believe they have the competences and skills to execute the practical strategies correctly. Table 4 presents the intervention design plan, summarising the focus areas identified in step 2 as well as the relevant strategies suggested in step 3. Sessions on how to cope with musculoskeletal pain (e.g. 3 conversations with a professional). The management and the hospital receive advice from an external consultancy on how to implement and prioritise the above strategies. 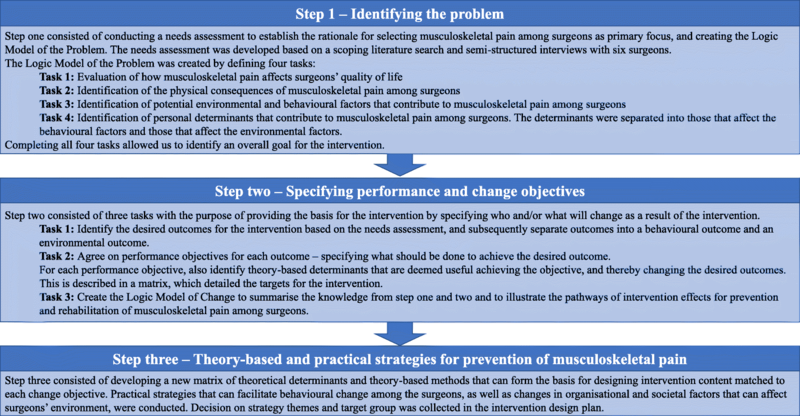 The aim of this paper was to describe the systematic development of feasible strategies that can prevent and rehabilitate surgeons’ musculoskeletal pain, by using an Intervention Mapping approach. Intervention Mapping proved to be a helpful tool in pinpointing the needs of the surgeons while developing practical strategies that can be applied for this occupational group. We conducted a needs assessment, examined the existing literature and interviewed six surgeons. From this, it was evident that musculoskeletal pain is an issue that needs attention, as it may influence on the surgeon’s future career. It was also evident that surgeons do not talk about their complaints, and that they have developed a certain culture – ‘if you cannot stand the pace, then you are out’. Additionally, most surgeons were not aware of opportunities to lower the physical demands in the operating theatre, e.g. how to vary work posture and how to place the surgical equipment to avoid awkward work postures etc. The results also showed that to succeed with prevention and rehabilitation of musculoskeletal pain among surgeons, it is important to involve the management and have their full support. The management’s prioritisation is crucial – especially regarding scheduling and allowing the time for surgeons to engage in health promotion initiatives. Theoretical determinants from Theory of Planned Behavior and Social Cognitive Theory were applied in the process of determining why and how to change behaviour. Altogether, this proceeded to the development of five strategies targeting physical exercise training, physical ergonomics, micro-breaks, knowledge of how surgeons’ work impacts on surgeons’ health, and how can the hospital and management prioritise surgeon’s work-related musculoskeletal pain. The Intervention Mapping approach was chosen as surgeons represent a complex occupational group, and to overcome what has previously been shown to be one of the big challenges of workplace interventions; limited effect due to substantial drop-out and low adherence to the intervention in question [37–40]. Within the past decade, the use of Intervention Mapping has increased, and it is now acknowledged as a useful, systematic and practical framework in the development of intervention designs [26, 27, 41]. Surgeons’ work is multifunctional and includes a number of different tasks, long shifts, and a work schedule that can be unpredictable. Thus, it may be hard to implement a successful intervention without a participatory approach. It should also be acknowledged that the optimal approach can vary from hospital to hospital or even from ward to ward. For instance, it was interesting to witness from the interviews that an initiative regarding physical exercise training within work hours may not be optimal for this occupational group. However, the surgeons were aware of the importance of being physically fit, thus, such initiative could be offered outside work hours. Also interesting was the value of a visible and active management, which according to the surgeons could be optimised. To succeed, the authors underline the importance of involving the management and identifying potential facilitators and barriers. The systematic approach used in Intervention Mapping is a strong feature, as the experience and information obtained in the process of tailoring and developing the intervention will be captured and, hopefully, benefit the present as well as future studies. A limitation in the present study is the low number of interviewed surgeons. Although the literature supported the essence of the interviews, we do not know if the results are generalisable in relation to implementation in other hospitals. There may be differences between hospitals and even specialties and it is important to use a participatory approach for the next three steps in the Intervention Mapping approach. The authors believe the proposed strategies are worth carrying out, possibly with small local adjustments. The present Intervention Mapping study demonstrated that musculoskeletal pain among surgeons is a complex area that needs attention. Our findings highlight a need for behavioural changes of the surgeons as well as organisational and attitudinal changes for the management. Future research could focus on the design and evaluation of the effect of focused interventions. The full interview data (transcripts) that support the study conclusions are unavailable for public access because informed consent to share complete transcripts (beyond the research team) was not obtained from study participants. All authors were involved in the design of the study. AH conducted the interviews, led the data collection and study management activities. TD, AH and LNA conducted data analysis and drafted the first version of the manuscript. PTJ and KS contributed to additional data analysis, interpretation as well as writing of the manuscript. All authors have read and approved the final manuscript. This study is exempt from approval by the Regional Scientific Ethics Committee for Southern Denmark as the study does not fall within the scope of the Medical Research Involving Human Subject Act (§14). Participants were carefully informed about the study, were assured anonymity and confidentiality and signed an informed written consent form. All participant information and collected data was handled according to the approval by The Danish Data Protection Agency.